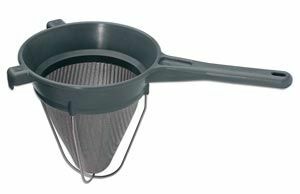 A chinois is a conical sieve with an extremely fine mesh. It is used to strain custards, purees, soups, and sauces, producing a very smooth texture. It can also be used to dust food with a fine layer of powdered ingredient.